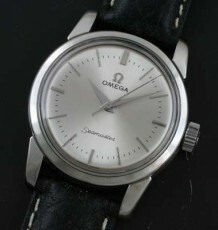 Scarce model with an unusual steel case. Sought after 18 jewel 30T2 movement. 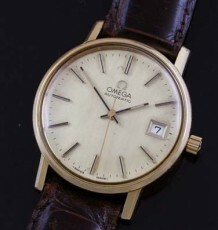 A rare vintage Omega watch from the 1940’s. 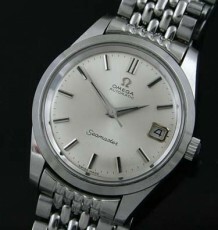 This watch is now sought after by Omega collectors as it was produced in limited numbers and sold in few markets. 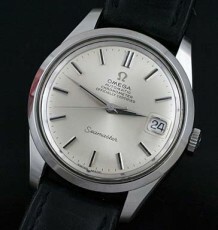 The most common version of the watch was the US Army Omega watch seen with a white dial and the words “US ARMY” engraved on the back. 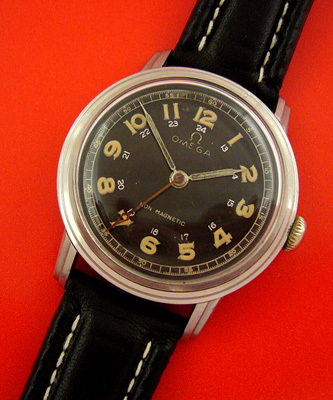 A civilian version of the watch was produced in a more stylish case and featured a black dial with red pointer seconds hand. The dial has been restored many years ago, however the watch still has the trademark red pointer seconds hand and stepped case. The case carries a reference number of 2254 and features a very heavy screw down caseback. Please note the stepped relief on the lugs and around the bezel ring. The ends of the case lugs also have a dramatic downturn to add extra presence to anyone looking at the watch on your wrist. The movement fitted in the watch is the legendary Omega calibre 30T2 SCPC which translated indicates it is a sweep seconds model with a shock proof balance. The 18 jewel count is unusual and the silver finish of this movement along with an early 10 million serial number, date the watch to 1944. The watch was recently serviced by my watchmaker and is keeping time and running well. The solid steel case measures 35 mm wide by 40 mm long. The watch is currently fitted to a black padded leather strap with white stitching.